In preparation for replacing the engine bed bushes and front anti roll bar bushes a second engine bed was sourced. I decided to prepare another engine bed with the uprated polyurethane bed bushes and then swap the beds over, rather than to fit the new bushes to the current subframe already fitted to the car. 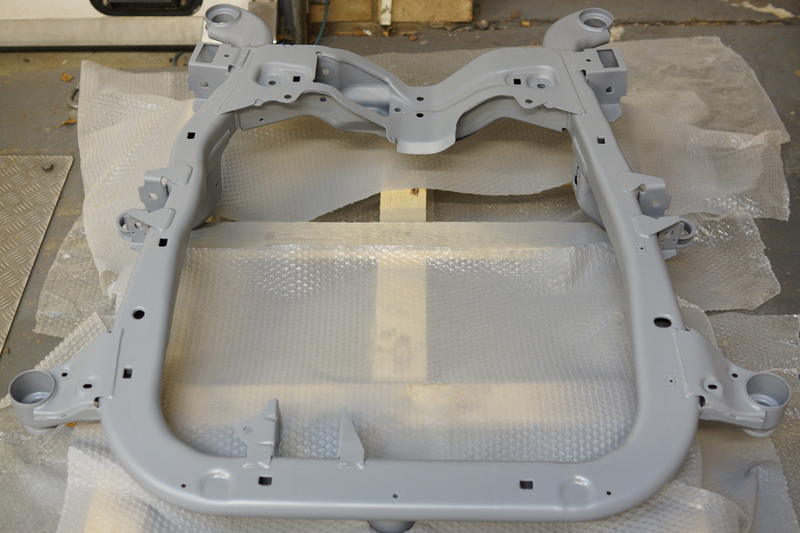 It also meant the replacement subframe could be painted first before being fitted to the car, as the subframes are subject to surface corrosion. 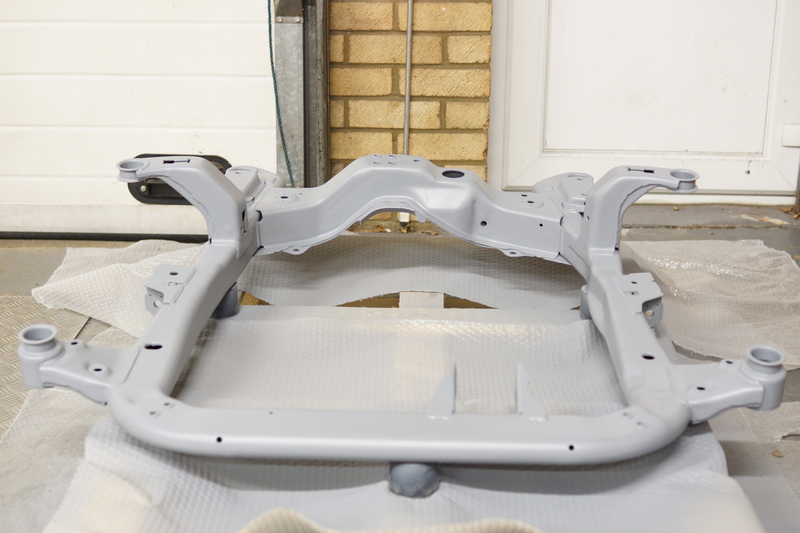 Preparing a second subframe will make the whole process easier, rather than having to remove and then paint the current subframe fitted to the car. 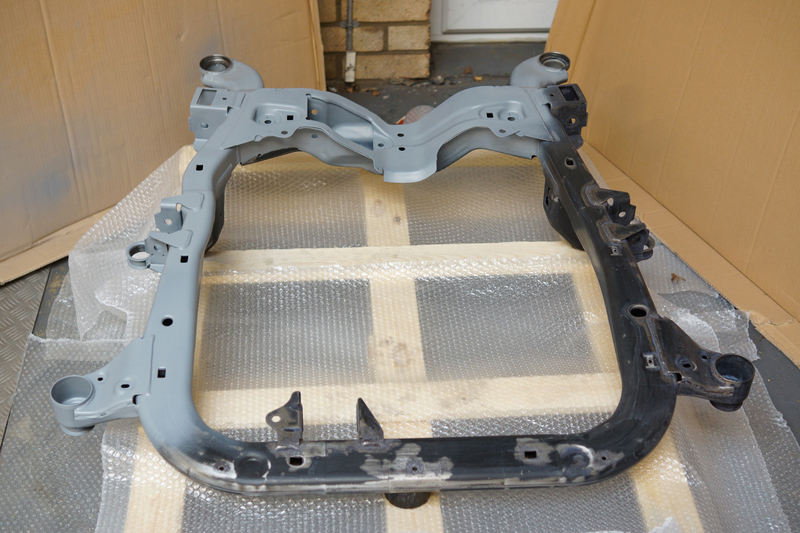 The new subframe will be cleaned up, the areas of rust removed, treated with a rust neutraliser, primed with a zinc primer (given several coats) and finally painted with a rust-proof metal paint, again given several coats. Then the uprated subframe bushes can be fitted to the new subframe. 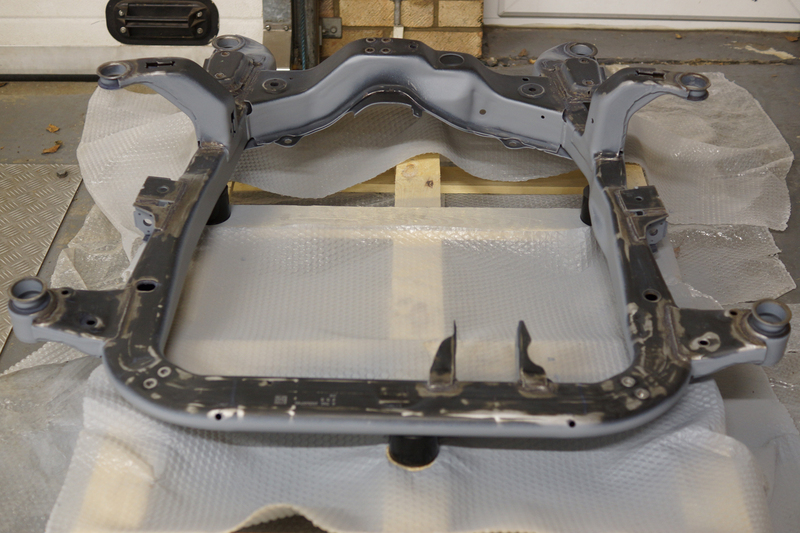 The existing subframe will then be removed from the car, the front anti roll bar (with new uprated anti roll bar bushes), uprated rear engine mount, wishbones and power steering rack will be transferred across to the new subframe which will be fitted onto the car. At the same time a PAS fluid change will be carried out. 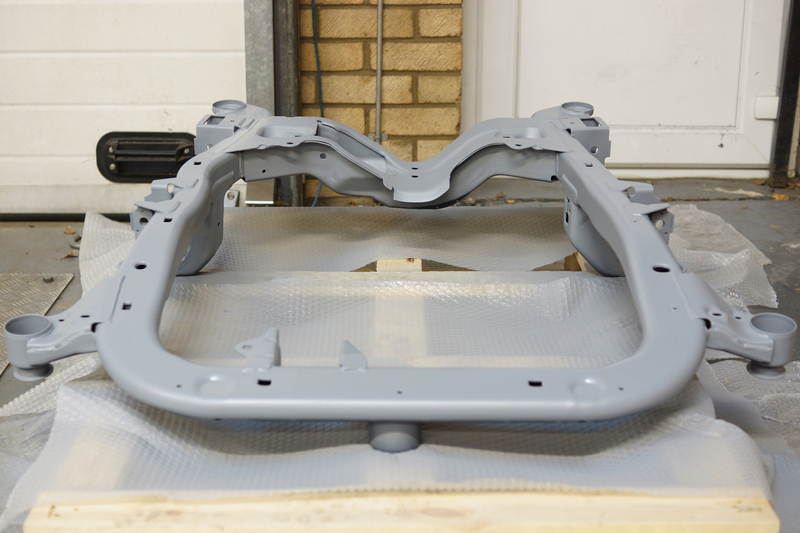 So the next stage was to strip it back and remove the main areas of surface rust, after which the subframe was treated with an anti-rust neutraliser to give a stable sound bonded surface, followed by zinc priming in preparation for the top coat. Engine Bed (underside) prepped and being primed. Engine Bed (top) prepped and being primed. 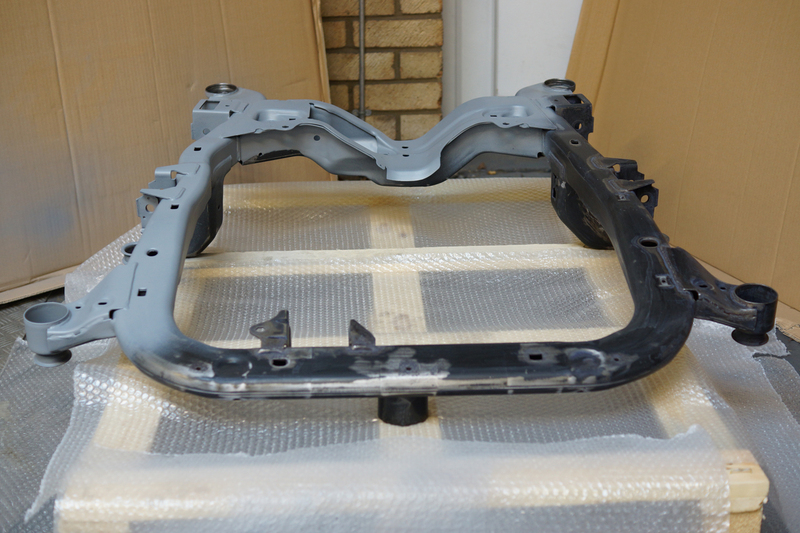 The final stage was to paint the subframe with a metal protection paint to give it an OE look. 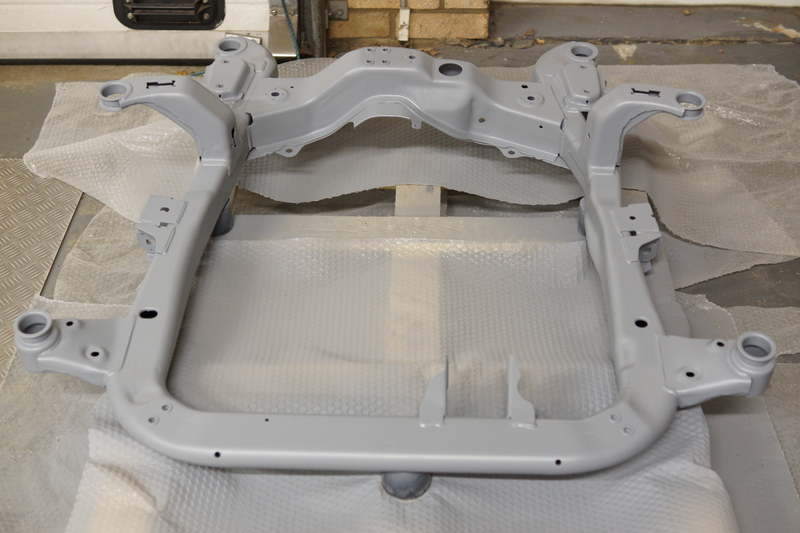 During preparation, priming and painting particular attention was paid to the areas that are most susceptible to corrosion, mainly the areas where the subframe has been welded. And with the uprated bushes fitted. Just the the swap over to do. 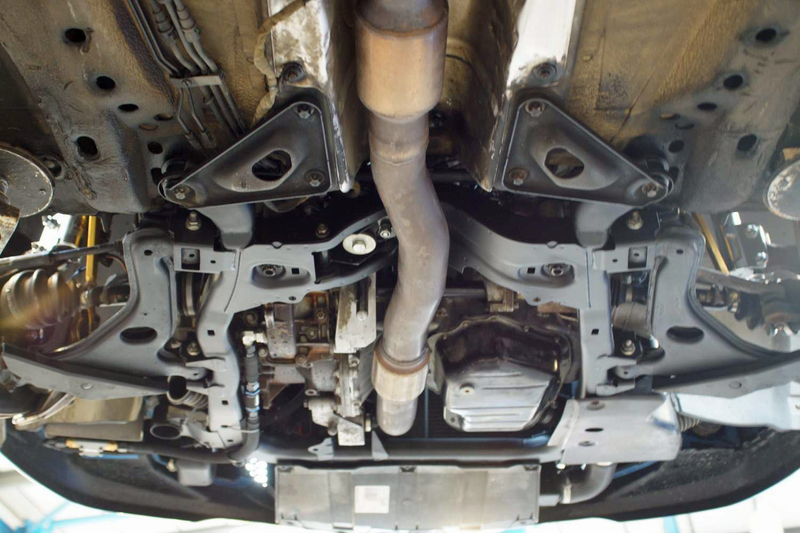 The original subframe was removed from the car and the front wishbones, front anti roll bar and power steering rack were swapped over onto the new subframe with the uprated black series Powerflex bushes which was then refitted onto the car. 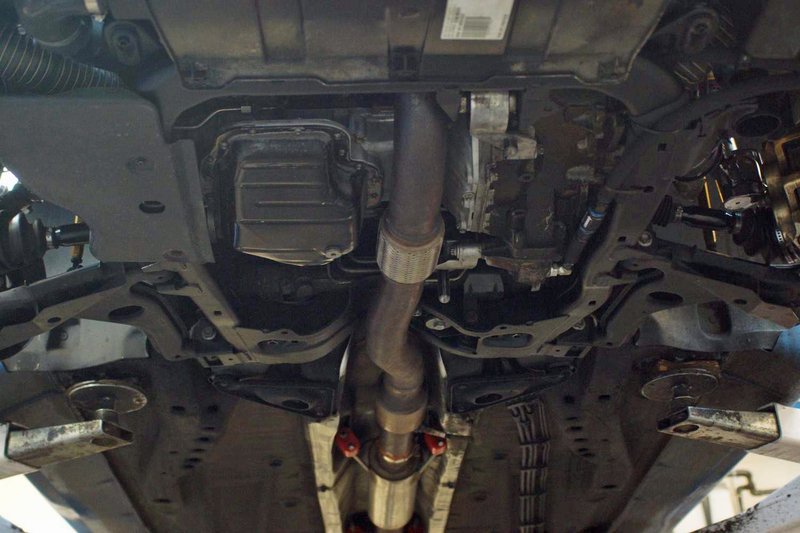 At the same time the factory anti roll bar bushes were replaced with Powerflex black series uprated anti roll bar bushes and the power steering fluid was replaced with new Pentosin CHF 202 fluid, as it had most likely been in use since day one. The exposed captive nuts and subframe bolts were treated to some AL1100 anti-seize spray when refitted, as it is not uncommon for the bolts to seize in. This is especially common due to corrosion from winter salt, which fortunately the car does not get exposed to. 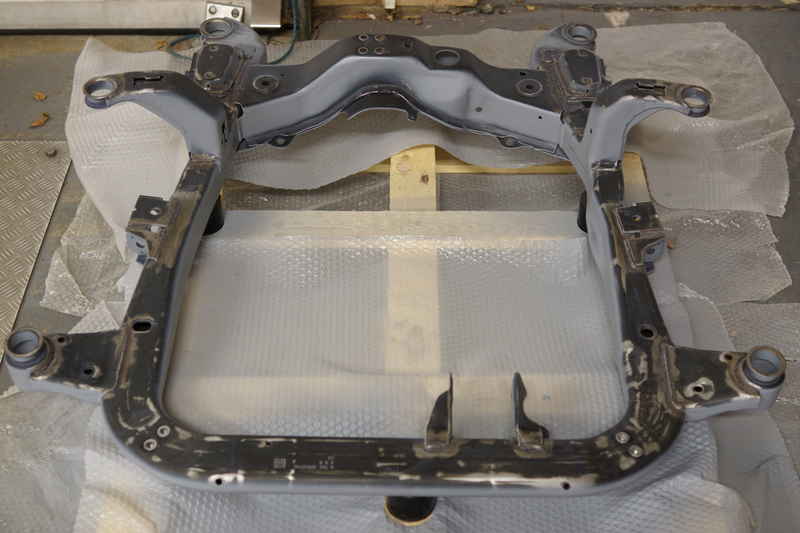 Additionally the exposed areas of the chassis were treated with Waxoyl underseal. The car is currently running the original factory anti roll bar bushes (which have now covered 88,000 miles) and these have never been changed so it is about time they were replaced. To replace them I have a pair of Powerflex Black Series track spec (95 Shore) anti roll bar bushes ready to fit. This will be a job to do when the engine bed/subframe is dropped as I will be fitting a set of uprated engine bed bushes over the winter. Due to the location of the front anti roll bar on the engine subframe, replacing these bushes with the subframe on the car is all but impossible. With the subframe off it makes the job so much easier. The aim is to get these fitted during December. The car has covered about 85,000 miles, and since it is being used on track an upgrade to the factory rubber bushes is in order. Whiteline Polyurethane Front Wishbone Bushes are being used, and at the same time due to the age and mileage of the original ball joints and drop links they are also having a refresh at the same time whilst everything is apart. Poly Bushes come as a replacement bush in two halves for easier fitting with a heavy duty central metal sleeve. The Whiteline poly bushes below are the front wishbone rear bushes which give a small caster change, to improve positive caster for better turn in. Whiteline poly bushes have a shore hardness of around 85-90, and so are much stiffer than factory rubber bushes.